‘The Lie’ By C. L. Taylor | An honest book review. 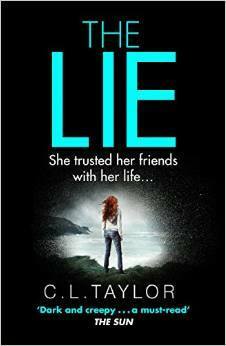 I selected CL Taylor’s latest book, ‘The Lie,’ based on my reading of her fantastic debut novel ‘The Accident.’ I was not disappointed. If the main plotline of four long term girl friends, Emma, Daisy, Leanne and Simone, embarking on a holiday together sounds like the premise for a standard ‘Chick Lit’ read, then the dark cover reveals something much more sinister within. As in ‘The Accident,’ C L Taylor begins in the present moment with the narrator, Emma. The story opens with an unsettling scene in which an aggressive man attempts to reclaim his mistreated dog, now living at the animal sanctuary where Emma works, and the subsequent discovery of her false identity. The reader’s appetite successfully whet by an identity question that needs answering, the author then very cleverly layers stories within stories, skipping between past and present events to reveal how the current situation came about. The four friends initially appear close, looking out for each other, protecting each other and supporting each other. Daisy and Emma in particular are best friends. Their bonds seems unbreakable, and the suggestion that the four go on holiday together to leave behind the stress of unpleasant jobs and relationship break ups seems a good one. Throughout the novel, C L Taylor maintains a slightly edgy, uncomfortable feel to her writing – perhaps readers, as friends themselves, can relate to some of the issues that develop on arrival at the retreat where they are supposed to relax and leave their stresses and strains behind them, and the cracks in their friendship begin to show. As the girls begin to cool towards each other, like freezing water in a rock, the cracks grow bigger and weaknesses start to show. Relationships of any sort need trust, honesty and openness to survive, but as all the hidden niggles and irritations with each other that have been beaten down in the past begin to rise to the surface, we watch the breakdown of their trust, aided by the emotional and physical machinations of their charismatic, psychopathic ‘host’ Isaac, destroy their friendship and lead ultimately to violence, destruction and ultimately death. I loved this book, as I did ‘The Accident.’ It was a real page turner exploring the complexities of friendship dynamics within a group from surface appearances to more sinister depths, and the effect of outside and unfamiliar influences on it. Isaac begins to take over the story as his psychopathic character grows, just as he begins to take over the lives of the girls and we are increasingly aware that this isn’t just a retreat and wonder if they will ever escape the cult as it is exposed in all its controlling, manipulative glory. We are brought back to the present to complete the story and follow the initial revelation of false identity to its conclusion – and C L Taylor nicely ties up all loose ends in the plot.